Tuesday December 19, 1944 at 11h30 the 193rd GIR was placed in alert. On the order of Major General Miley, division commander, it had to prepare itself for an airborne operation toward the European continent. Such travel was not a simple act to realize in so little time. The Ardennes’s situation dictated the emergency. It was important to forward these twelve thousand men on the operation area in the best time. The operation plans were hastily realized and a lot of meetings were organized. So at 11h45 a first meeting brought staff’s officers and commanders of each battalion together. At 13h00, it was company commanders who joined together for being informed about the future operations. It was decided the Regiment would be dispatched in the continent by air. A little party made the travel by sea. When the division will arrived, it will be assigned to the 12th Army Group. Its mission will be to defend the west bank of the Meuse River all around the little city of Charleville-Mézières in the Meuse department, France. The 193rd Glider Infantry Regiment received the war code CHALK. CHALK RED was the First Battalion (Companies A, B and C) and CHALK WHITE the Second Battalion (Companies D, E and F). The end of the day and a great part of the next one were used to prepare the travel. Wednesday December 20, 1944 at 20h00, after more than twenty-four hours of intensive preparations, the Second Battalion left Camp Chiseldon for joining Membury airfield. The weather was so bad that the flight was delayed. Thursday December 21, 1944 from 07h45, the men who made the travel by sea started toward Wyemouth harbor. They arrived at 18h00. At 15h00, the billeting party of the Regiment went to the assembly area of Greenham Commons. The flight was also differed. At 18h30, it was the First Battalion who left Camp Chiseldon for Membury. The men were obliged to stay on the ground because the weather was too bad. So it was important to take up the free time and the young impatient Gi’s were obliged to maintain and to clean the material. At 19h30, the men arrived at Wyemouth embarked in boats. Friday December 22, 1944. The soldiers who left England by sea arrived in France after a quiet travel. They disembarked at 08h00 in Le Havre harbor in Normandy. So they were the first men of the unit on the European continent. At 14h00 the Regimental Headquarters were the last part of the unit to leave their base camp. The weather was always bad and it was impossible to take off. The Headquarters opened so a provisional command post at 16h30. At this time all the men who had to travel by air were in Membury airfield. 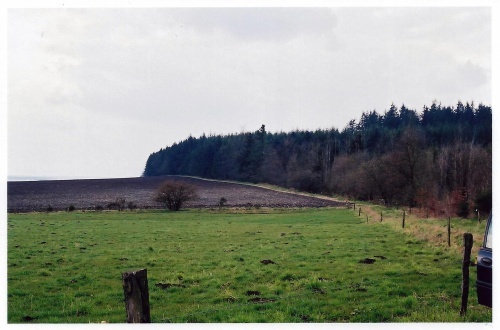 They waited with feverishness when the weather suddenly became better but few hundred kilometers ahead the men of the 101st Airborne Division were surrounded in Bastogne. Few German divisions tried to keep the little city and the Gi’s fought at one man against five. For three days they contained the German assaults but now they lacked of near everything. They were obliged to ration food and ammunition. There was a lot of wounded men and it was now difficult to take care of these soldiers. The emergency of this situation prescribed to make the maximum to help their guys and the Headquarters decided to organize an air supply. All the available planes were so requisitioned. At 21h40, the Second Battalion received the order to unload all planes because they had to serve to supply Bastogne the next day. Saturday December 23, 1944 was a quiet day. The climatic conditions remained mild but the men stayed on the ground because there was no plane available. In Bastogne, two hundred and forty-one planes parachuted hundred and fifty tons of supply. At 13h00, the troops in Normandy pursued their travel toward Rouen sailing the Seine River. 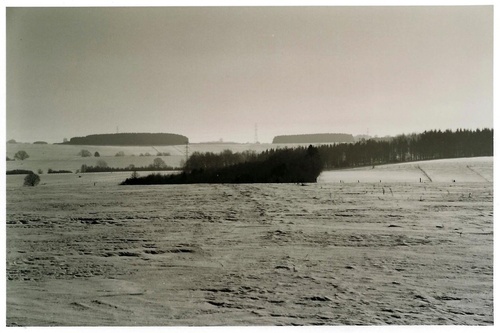 This nice unpublished photo was realised by civilian poeple after the battle of Bastogne (in spring 1945). It shows a C-47 plane who had participated to the supply of Bastogne. 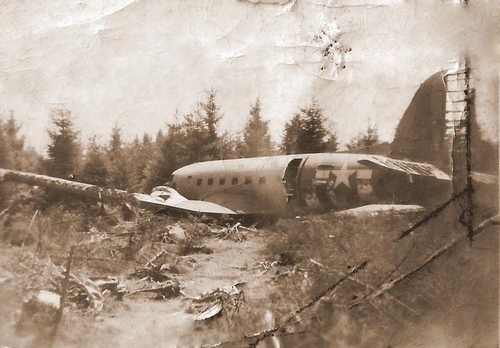 The plane was shot by the german Flak and landed in emergency near the village of Remagne (TFH collection). Sunday December 24, 1944, the men who sailed the Seine River arrived in Rouen at 11h00. They started landing at 11h30. Hundred additional tons of supplies were parachuted on Bastogne. In that day of Christmas Eve, after waiting for nearly four days, the situation finally made progress. At 14h00 the Second Battalion received the order to take place in the C-47 planes. Douglas C-47 airplanes of the 76th Troop Carrier squad (CW)- 435th Troop Carrier Group - 50th Troop Carrier Wing - 9th US Air Force probably during autumn or winter (Welford, England of France). 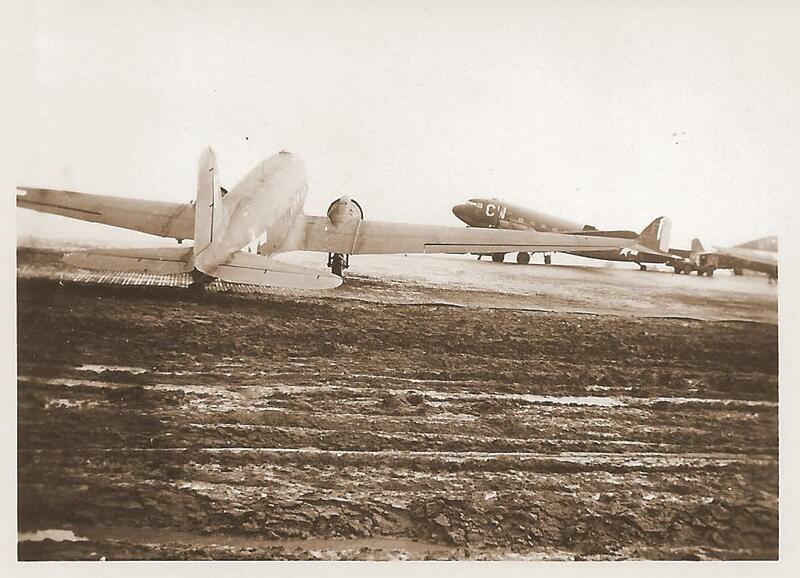 This scene is probably very similar to Membury airfield on December 1944 (unpublished photo - TFH collection). At 15h30, the advance party in Rouen embarked in trucks. They drove toward Mourmelon camp in Marne, France. At 16h04 the first planes took off. They carried the billeting party of the Regiment. They were landing in Orleans, France since 18h20. At 17h00 it was the Second Battalion, which took off toward Prunay airport near Reims, Champagne, France. They landed at 19h20. Thirty men of Company E and twenty of Company F stayed at Membury. 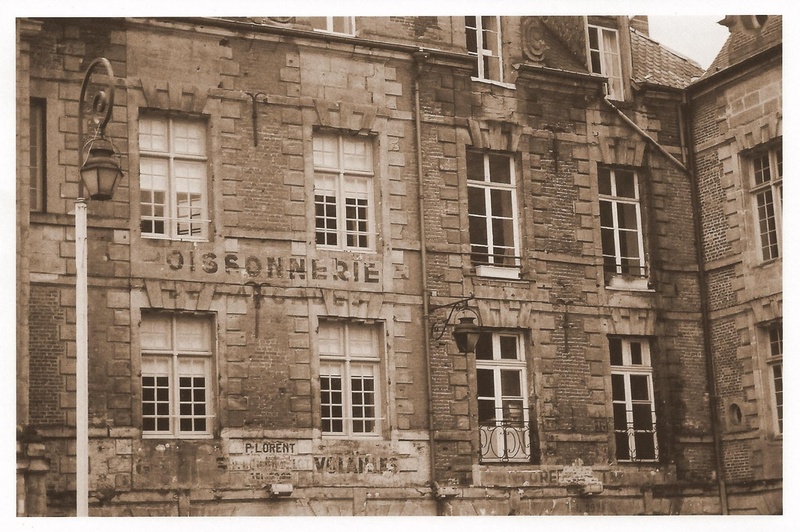 Monday December 25, 1944 at 04h00 the Second Battalion was the first to arrive in Mourmelon. It was directly followed by the sea part, which arrived 15 minutes later. At 10h00, the billeting party left Orleans for Prunay where it arrived at 11h40. Since there it was transported in Mourmelon. It arrived at destination since 16h00. It was that day the Division was officially attached to the 12th Army Group. At 20h00 the Second Battalion was alerted and sent toward Boulzicourt. Christmas dinner was Ten in one canned field rations larger than K rations. The kitchen trucks and all heavy equipment would come by boat (Phillip J Rice). The Chaplin said Christmas Mass. - The 680° Glider Field Artillery Battalion. - Company A, 139th Engineer Battalion. - First Platoon of the 224th Medical Battalion. - The Second French Battalion . At 10h30, an advance detachment composed by Colonels Schorr, Balish, Oswald and Captains McCrary and Cross left Mourmelon for going to the 392nd Engineer’s Headquarters  at Charleville-Mezieres. They arrived at 17h00. 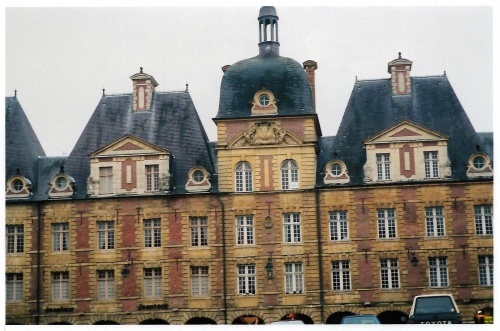 Charleville-Mezieres is a little town in the Meuse department, France located along the Meuse River. The center of the town has not changed since 1944. These two photos were realized in spring 2001 (TFH collection). At 14h30, the First Battalion except one plane out of order left England for Prunay. It arrived at 17h30. At 18h00, the 392nd Engineer was officially attached to the 193rd Combat Team. At 21h00, the first echelon of the First Battalion arrived at Mourmelon. It had just arrived when it received an order for making movement toward Boulzicourt in the best time. This order came from the advance Headquarters located at Charleville-Mézières. At 22h00, the sea part was placed on alert because there were some rumors of enemy parachuting. It is important here to insist on the state of mine that prevailed in the American lines. There was a real fear of a nazi infiltration behind the first line. This fright can be explained by two facts. The first one and probably the most important at that time was a German operation called « Stösser ». Baron Friedrich August von der Heydte realized it. It consisted in an approximately eight hundred soldiers parachuting in the Fagnes area, Belgium just behind the American first line. Like this the paratroopers could take the important crossroads of this area and lock the American fresh supply that was to go on the north flank of the offensive. 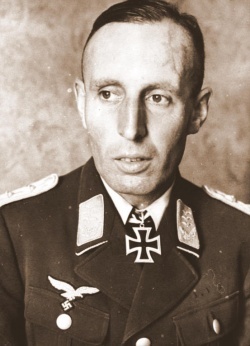 Unfortunately, for the preparation of this operation, von der Heydte had not a lot of time. He had to find paratroopers but there are few years any airborne operation had not had realised. The last one was in Crete Island in 1941. At that time the German airborne divisions fought like simple infantry divisions. So he didn’t have a lot of experimented paratroopers and it was impossible in so short a time to school new men. We found the same problem with the young pilots of the Luftwaffe (German air force) that were inexperienced. Another important problem for von der Heydte was the fact it was the allied aviation that had the control of the sky. It means his operation had to be realized during the night. So we understand it was not an easy job for von der Heydte to plan such an operation in these conditions. This airborne operation started during the night of December 17, 1944. More than hundred Junkers Ju-52 planes took off from Paderborn and Lippspringe airfields between Cologne and Berlin, Germany. The weather was awful and the dispersion was important. Only a few sticks reached the objective. Most of the men fell in their own lines. Baron von der Heydte could not make anything. The men of the 9th US Infantry Division captured him on December 22, 1944. The operation was a total strategical failure but it produced a terrible psychological impact on the US soldiers. The most incredible rumors circulated during a few days. A lot of enemy parachuting reports arrived from all the operation theaters producing confusion and panic. These facts were found in the official US Army unit reports. As we’ll see it later, the death of Sergeant Elton Long was imputed to such a fight with German soldiers. However it is not possible. At this time, the first line was more than fifty miles further. 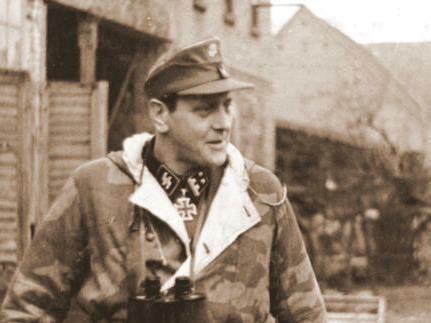 The second German special operation was called « Griffon » and was organized by the SS Sturmbannführer Otto Skorzeny. He had the mission to take some bridges on the Meuse River between Namur and Liege, Belgium and infiltrate the American lines with his 150th Brigade for creating confusion. For this circumstance his soldiers wore the US uniform. Only a few men could infiltrate the American lines and the most part of them were captured. It was also a strategical failure but for a few weeks a real spy hunt existed so adding to the great confusion that prevailed at that time. This is the two men who spread trouble in the American’s minds. From left : Baron Friedrich August von der Heydte and SS Sturmbannführer Otto Skorzeny (Bundesarchiv). Wednesday December 27, 1944, the First Battalion made movement from 03h00 on and arrived at 08h30 on destination. The first man of the Regiment was killed that night. It is Sergeant Elton L Long (37520310- Co E). A report from the S-3 of the Second Battalion explains that Sergeant Long was in the head of a three men patrol when he intercepted a German five men patrol at 04h00. There was a short fight during which Long was killed. This report is wrong and illustrates very well the explanations above. In reality Long and his man met a FFI (Internal French Forces) patrol but didn’t recognize it in the darkness. The two patrols opened fire and Long fell from a “friendly fire”. 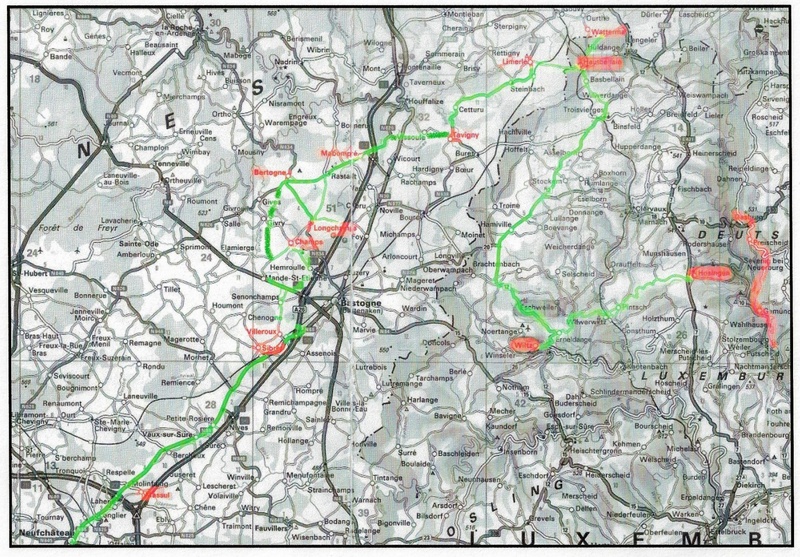 - The 392nd Engineer received the mission to defend the Meuse river bridges in the area. - The Second Battalion had to organize a strong defensive position in the east bank of the river. From there it was organize depth patrols. 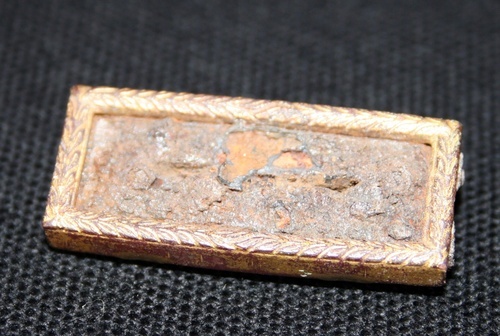 - The First Battalion was placed in regimental reserve. It had to organize patrols in the west, on the rear of the regiment. At 12h20, the Regimental Headquarters remainder was dispatched toward the continent. It landed at Prunay airfield at 14h20 and took the direction of Mourmelon and besides Charleville-Mézières. At 15h00, we reported fifty German paratroopers had landing near Mouzon few hours before (at 11h30). Colonel Schorr sent Company A to help the 194th Regiment patrol in this area. It set off at 16h15 and came back from 22h00 on. They find nothing. 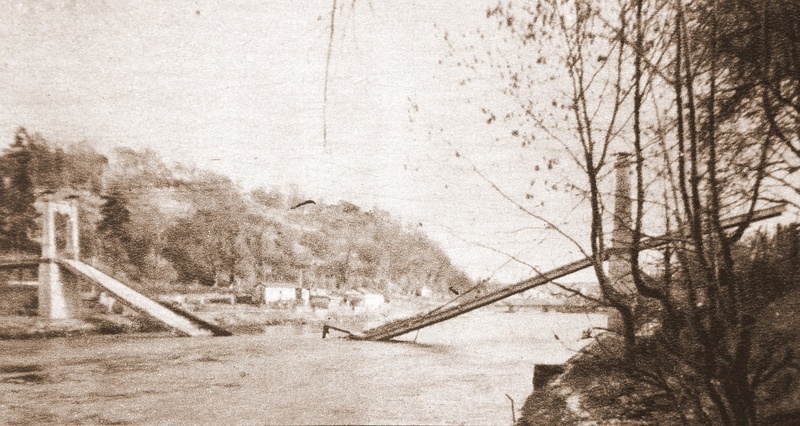 “Whatever was the weather each bridge in the area must be kept by an officer of the 193rd Regiment. He will receive the help of an officer of another unit”. Then and now. 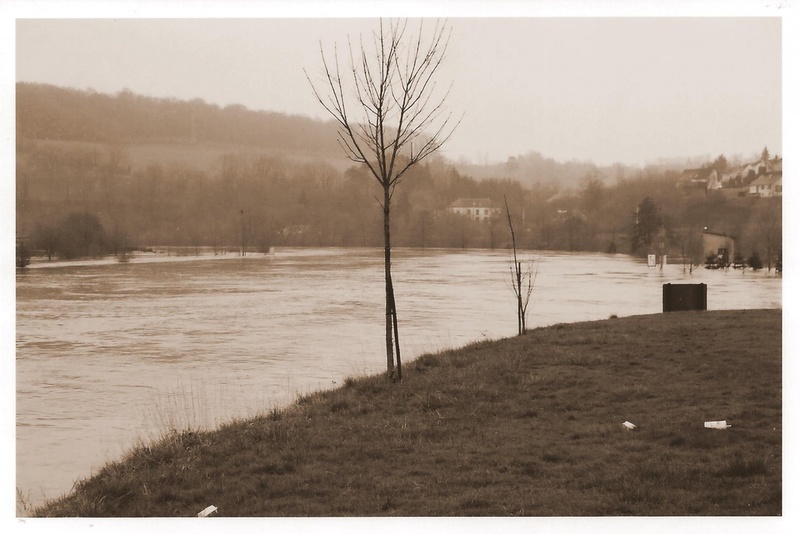 These two photos illustrate the Meuse River with a 57 years delay. In 1944 (above) Germans had destroyed all the bridges to stop the American advance. Now we only find now only new bridges in this area. Underneat we see the Meuse River a few miles downstream side of Charleville-Mézières in spring 2001 (TFH collection). “Our company was to guard the bridges at Charleville. Two of us spent 12 hours per day in an upstairs room with a machine gun trained on a bridge. The French family downstairs brought up coffee so strong I could hardly drink it. For a day or so the bulk of the company stayed at a school in town. One of the M.G.’s received a minor wound removing his folding stock carbine from its scabbard. The mortars eventually moved to the hill that the Cross of Lorraine was situated on. A sunken Quonset hut was our bunker. From it trenches led to our guns (81’s). 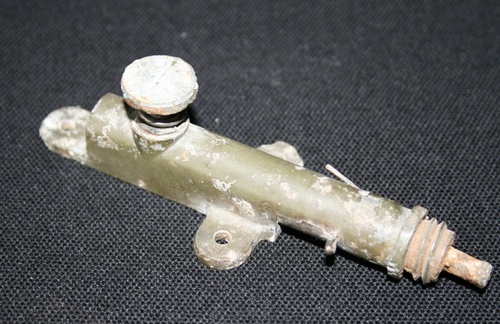 There was one 90mm AA the army using to deal with “Bed-Check Charlie” the nightly German air raid. Until our arrival the gun crews made changes during the night. After being fired-on they changed their schedule to daylight. During the night other reports of Germans landing were pointed out. Friday December 29 and Saturday December 30, 1944 were quiet days without important facts to report. Sunday December 31, 1944. In this last day of the year Brigadier General John L Whitelaw, the assistant division commander, inspected the south part of the 193rd Regiment’s defensive area. At 16h00, the Second Battalion moved to a new location near its Command Post. Since 20h40, the German Air Force bombarded the little village of Vouziers. Company F, Second Battalion was also bombed but there was no damage. The 193rd Regiment celebrated the New Year’s Eve there. It seems there was an important nazi air force activity during that night. Monday January 01, 1945 at 14h30 Brigadier General John L Whitelaw visited the north part of the position. At 18h15 the Combat Team except the 392nd Engineer and the First Platoon of the 224th Medical Company received the order to be ready for a movement in the next two hours. At 22h00 it received the departure order toward Belgium. The assembling area was in the woods near a village called Massul. This is actual views of Massul, first Belgian assembling area where arrived the 193rd GIR during January 02, 1945 night. The woods on the second photo are probably the assembling area (TFH collection). Massul is a little village composed of a few barns on the top of a hill. 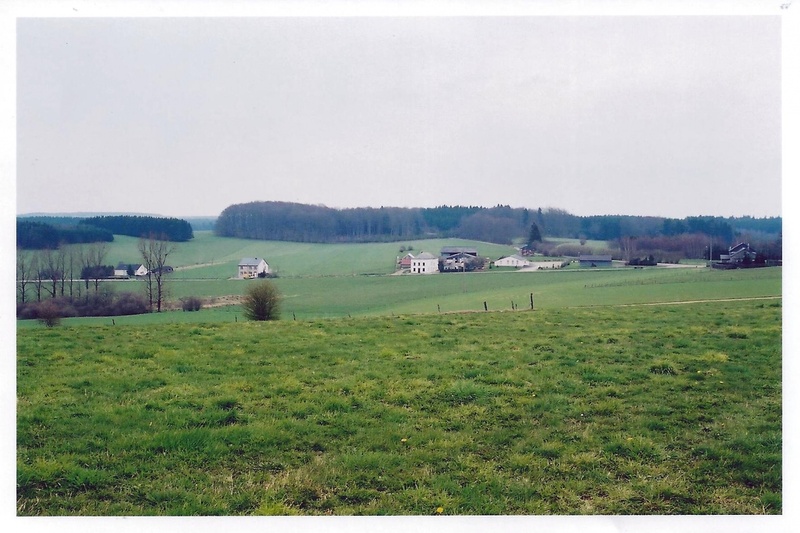 It is located a few kilometers northeast of Neufchâteau in province of Luxembourg, Belgium, on the right side of the Neufchâteau-Bastogne road. On the left side of the road that goes to the village, there is a large wood area. The assembling area was probably located at this place. Allen Myers (Company E) was Private First Class at that time. He remembers very well he had make the travel into back of a truck. At this part of the year, traveling at the back of a GMC truck is not a pleasant thing. Accumulated in the dark, you are jostled all the time because of the bad frozen roads and rapidly the fresh bitter wind adds to the discomfort of the travel. However it was difficult for the quartermaster corps to organize a good supply of specific winter wears, each man received the maximum of warm effects to go on the first line. Allen wore long wool underpants with two wool trousers (probably M41 type) and a pair of wool socks. 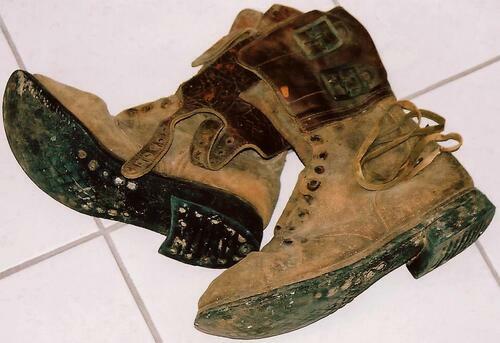 The shoes were the M42 Para boots without overshoes. The men who were not paratroopers wore the new M43 buckle boots. Apparently he wore a field jacket M41 model and a wool overcoat over all his cloths. He had a pair of wool and leather gloves. The steel helmet was the standard M1 model. Officers wore trench coats with wool liner. Tuesday January 02, 1945. The men arrived in the vicinity of Massul during the night. Hardly had they arrived, the Regiment received order to take the place of the 11th Armored Division at Sibret. The two battalions arrived from 04h00 on. In the dark, they took a defensive position all around the village. 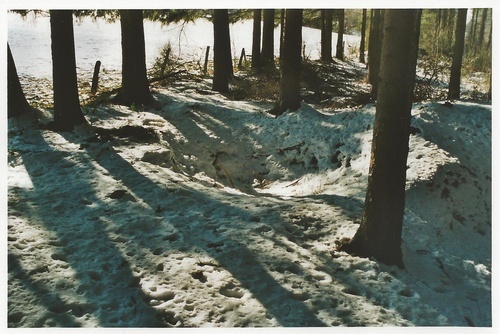 The ground was frozen and it was impossible to dig a foxhole to take shelter. 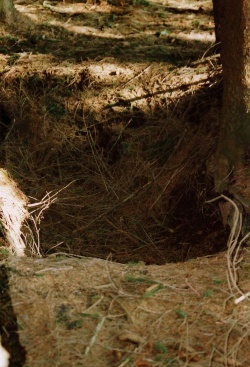 The Gi’s took up the foxholes dug by the Germans during the first part of the battle of Bastogne. At 07h00, Regimental Headquarters came and opened their Command Post in the village. Most of the equipment that came by boat arrived and the men were ready to contribute to the repulse of the bulge. During all the day, the weather was cold and cloudy. At 18h00 a German break-through was pointed out at Monti. It seems that Clifford E Thomson (HQII) died this day. This map shows a global view of the distance covered by the 193rd Infantry Regiment in Belgium and Luxembourg. We can see the journey in green and important areas in red (TFH collection). Wednesday January 03, 1945. At 17h50 the Regiment, except the Second Battalion, was placed in divisional reserve. The VIII° Corps sent a new assignment order for the 2nd Battalion. It passed under the direction of the 101st Airborne Division. It had to go to a new location area on the southeast of Bastogne. 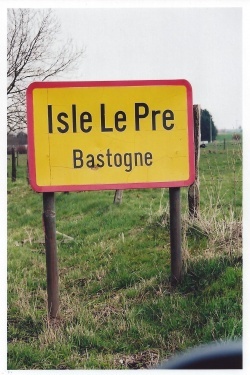 The assembling area was in the woods in the vicinity of the little village of Isle-Le-Pré. 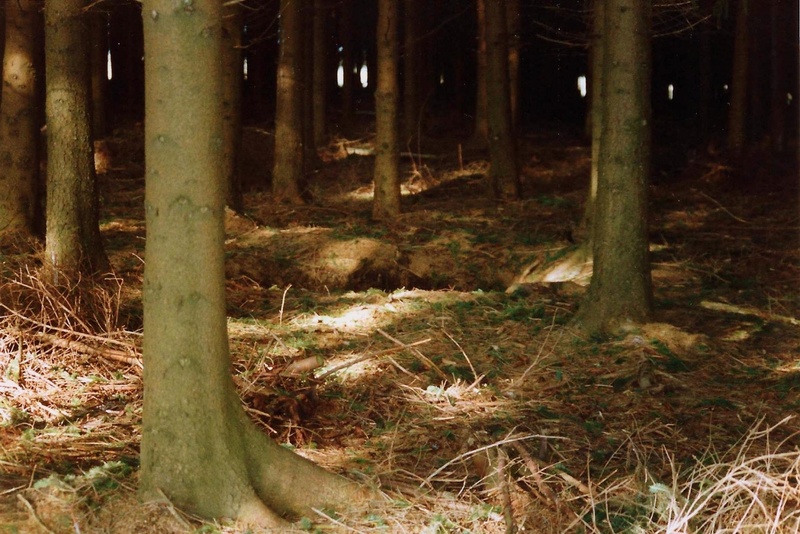 These woods are located on the left side of the Neufchâteau-Bastogne road, between this road and the railroad that connect the same towns. The exact US World War II coordinates are 52-56. There is a slight doubt in my mind because I have found two different dates but the same hour for those facts. So I don’t know if it is took place on January 02 or 03. During the night the remainder part of the Regiment made movement in the direction of the woods taken up by the Second Battalion. This is the actual area (summer 2001) where the 2nd Battalion was located on January 3, 1945 (red arrow). 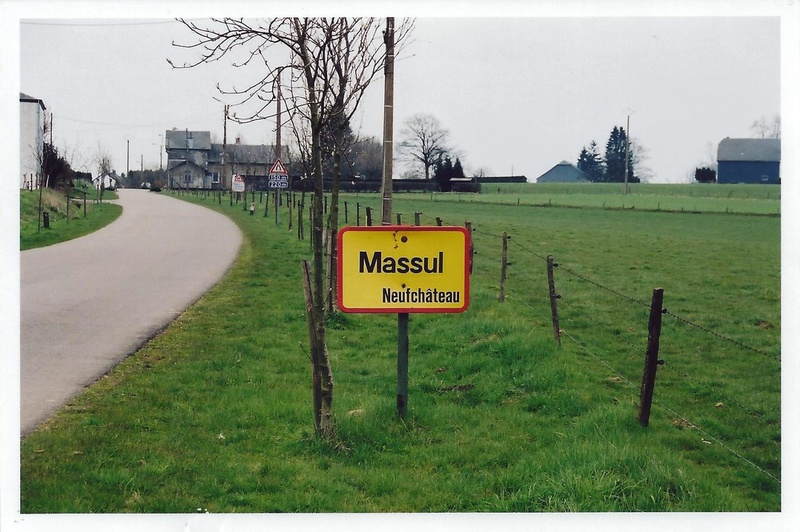 I was located on the Neufchateau - Bastogne road when I made the photo. The red old railroad is behind the first wood. Bastogne is toward the right side (TFH collection). Thursday January 04, 1945. 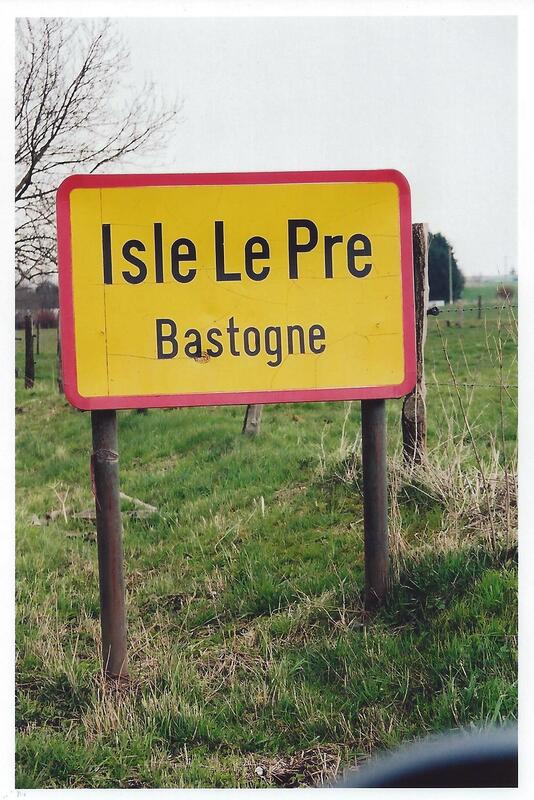 At 11h00, even though we heard the sound of the battle more on the northwest (the 194th Regiment made their first attack which was the start of the Battle of Dead Men’s Ridge), the Regimental Command Post was transferred in the vicinity of the village of Isle-la-Hesse. The exact position indicated in the official US Army records is 526-585. 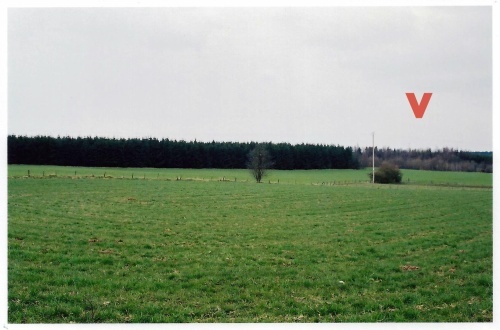 These coordinates correspond to a place located in a path at approximately 275 yards of the National 4 road (the Bastogne-Monti highway) near a little stream called « Rau de la grande fontaine » (it means « the great spring stream »). The unit stayed in divisional reserve all the day. At 14h30 an artillery fire hit the Command Post and three men were wounded. The fit woods where the 193rd GIR was located on January 04, 1945 are still present today. This is the position in summer 2001. 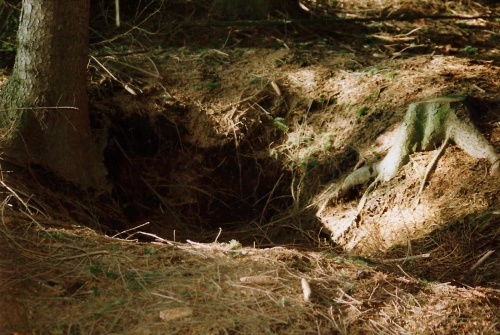 In the woods it is still possible to see old foxholes. 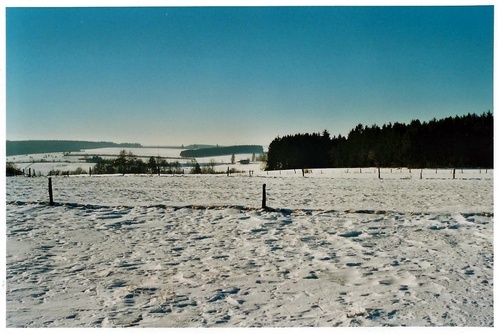 Bastogne is behind me and the little village of Villeroux is toward the left side of the photo (TFH collection). At 17h00 the entire Regiment was assigned by divisional order to the 101st Airborne Division. At 17h30 the Regiment moved to a new location. It was in woods in the vicinity northwest of the village of Villeroux at US coordinates 50-56. The aim of this maneuvering was to support the 513th Parachute Infantry Regiment, other part of the 17th Airborne Division. That last unit was located more on the north in « bois de Fragotte » (« Fragotte » woods), « bois des valets » (« jacks » woods) and in village of Flohamont. Two trucks exploded in mine field. 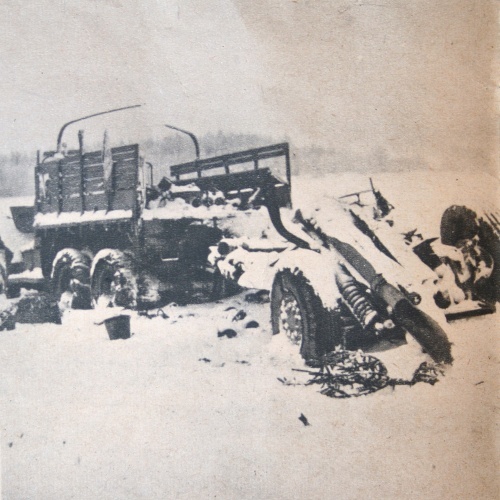 Two trucks exploded in mine field ("The Talon" TFH collection). Friday January 05, 1945. The men got early and had K rations for breakfast. The weather stayed awful during all the day. It was very cold. Temperature didn’t pass below 22° F. The visibility was poor and didn’t exceed five hundred and fifty yards. Strong gusts of snow lashed the plain in the morning and snow started falling again in the afternoon. 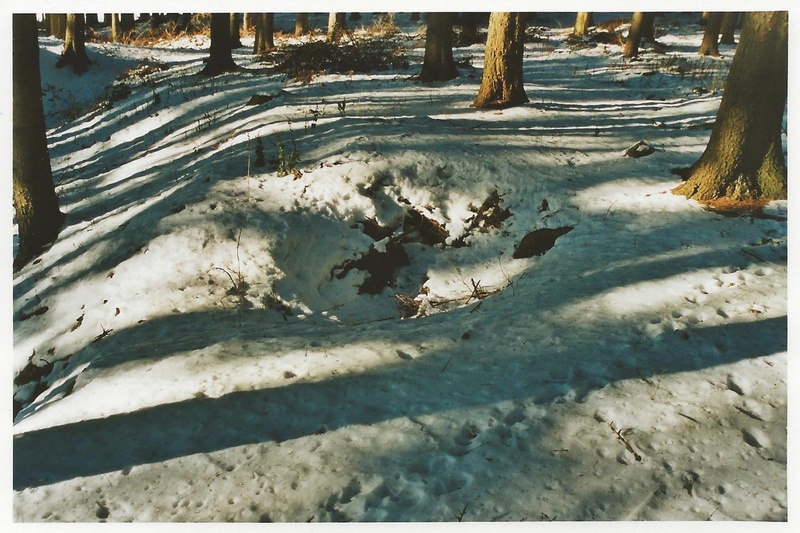 The ground was frozen and was overlaid with a dense bed of snow. The First Battalion was sending on the northwest toward the vicinity of Monti. 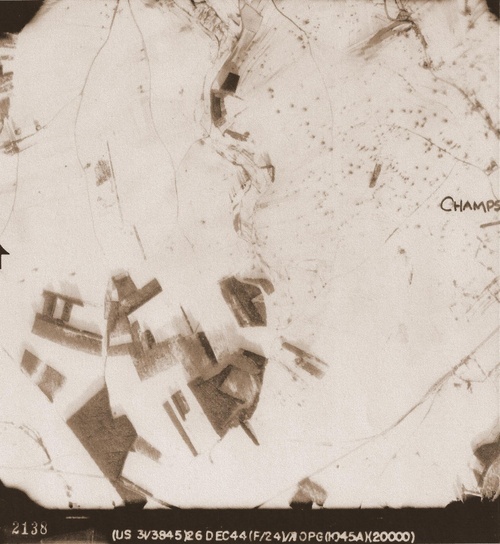 C Company established its position in the woods north of the little town just above the village of Mande-Saint-Etienne. This photo was realized on January 5, 2002 shows the position that Company C occupied just 57 years before. Mande-Saint-Etienne is on the left side of the photo. 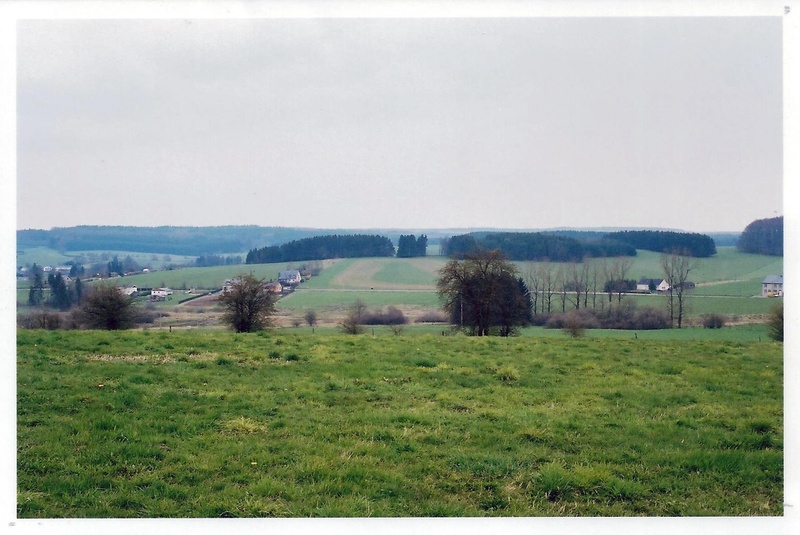 In the horizon line was position of the 513th PIR. Front line was several hundred meters on the right side of the picture (TFH collection). 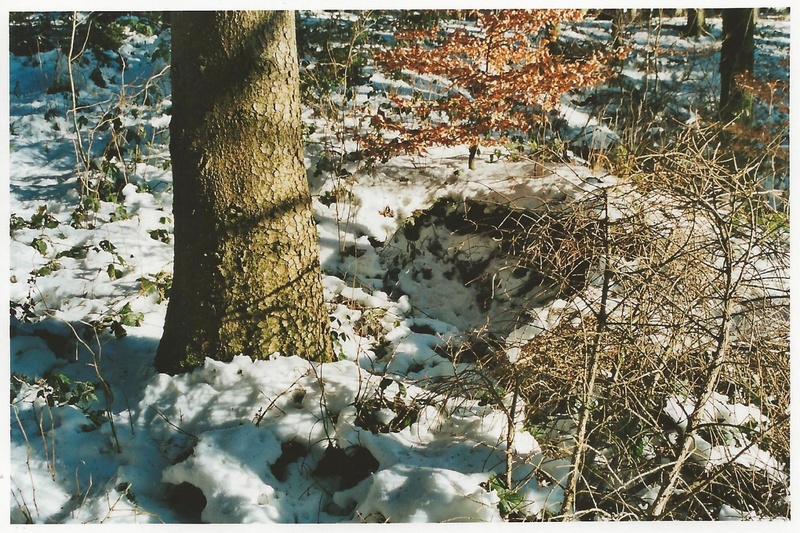 In the woods, it was still possible to see the foxholes occupied by the troopers of Company C in 2002 (TFH collection 01-05-2002). 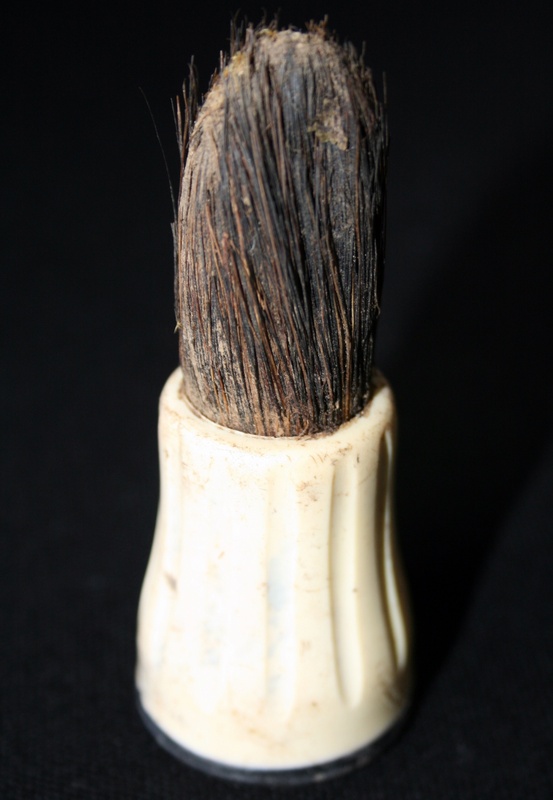 This shaving brush was found around a fox hole located in the positions that Company C occupied on January 05, 1945 (TFH collection). At 10h00, during the travel toward the new position, a jeep of the Second Battalion full of men exploded on a mine when it passed on the National 4 road. One man was killed and six others were wounded. I have found two men killed at that date. The first one is Warrant Officer George J Sebian (W2124399) who is reported « killed in action ». So it is probably the man who was directly killed. The second one is Technical fourth grade Jack Senk (33670182 – Co Service) who died after wound. He was possibly in the six-wounded group. The Regimental Headquarters was hidden in the fit woods near its position between 10h30 and 12h40. After that it went in a new position few hundred meters more on the northwest in a barn located at fifty-five yards near the National 4 road. The Second Battalion was sent in woods near the Regimental Headquarters area. Around noon the men of the Company HQII arrived at an area where the 101st had been. There were land mines and booby traps in the area plus more bodies. A fellow in the foxhole with Ruff Bonner (Company HQII) was hit and killed (may be it is also George Sebian or Jack Senk?). This was the first day that soldiers (at least in the Company HQII) went to first aid with frozen feet and First Sergeant Walenga was one of the first to do so. Two woods at a top of a plateau that dominates the Mande-Saint-Etienne plain compose the area. At this place the wind came from the plain and seeped through the fit trees. That adds a supplemental impression of great cold. This the two woods (on the horizon line) see from the german side of the battlefield. They don't longer exist (TFH collection). Once time again the only shelters are provided by the foxholes dogged previously by the men of the 327th Glider Infantry Regiment. The weather conditions were exceptionally difficult and there bad covers are unable to protect effectively the GI’s. Now it is still possible to see american foxholes in many Ardennes woods. These ones have been photographed in 2000, in the woods where Company E was located in January 05 to 07, 1945. This wood no longer exist (TFH collection). This pair of buckle boots was found during dig (around year 2000) in the woods occupied by Company E - 193rd GIR between Januray 05 to 07, 1945. Note the exceptional condition for a pair of shoes who have stayed more than 55 years underground ! Unfortunately they are stolen in my collection (TFH collection). 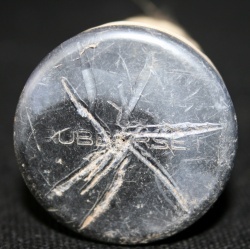 Other souvenirs found during digs in the same woods. You can recognize Lieutnant and Captain insignias, Presidential Unit Citation (certainly belonging to a member of the 327th GIR - 101st AB Division) and a presure type firing device (M1A1) (TFH collection). The frozen feet caused great problems during that winter. They caused a great percentage of wounds and the officers were obliged to make the maximum to avoid there problems. Allen Myers remember his officer the 2nd Lieutenant Leslie Telesca wanted tear up his jacket wool liner for wrapping the feet of his men. The day and the following night were quiet. The Regiment as a whole was now on the first line and it was since that position it attacked in January 07. Typical view of GI's living in the Ardennes woods during winter 1945-45. This photo was realised on January 3, 1945 by Private A.H. Herz (U.S. Army Signal Corps) on the south-east frontline of Bastogne, not in the 17th AB Division area but in the 320th Infantry Regiment - 35th Infantry Division. 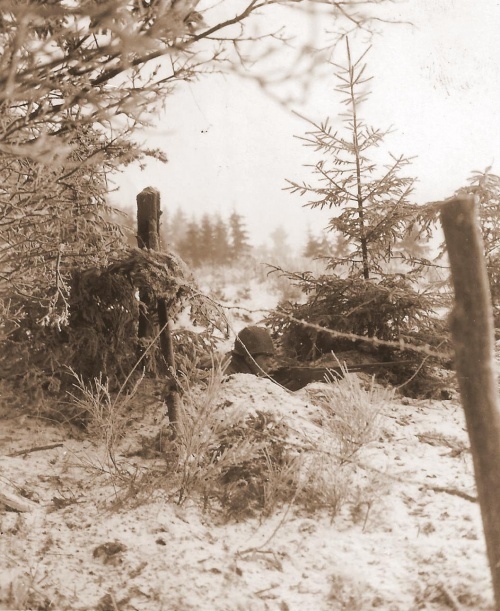 The scene is very similar with the north west frontline (credit U.S. Army Signal Corps - TFH collection). This map is a partial copy of an official US military map dated 1943. 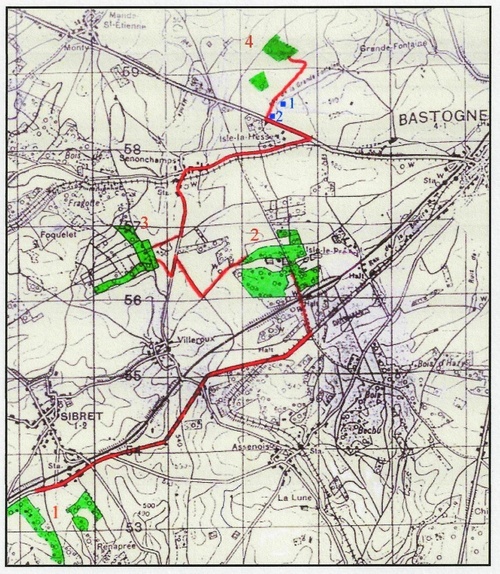 It synthesized the route of the Second Battalion between January 02 to January 05, 1945. 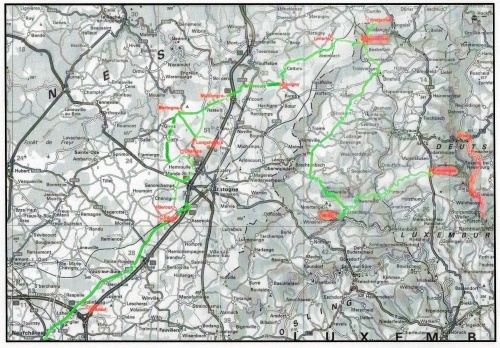 In green are the positions that the battalion successively occupied. Postion 2, 3 and 4 are sure. Position 1 is supposed. In red is the way that the men would have reasonably take (it is not sure but I haven't found more information about that). In blue are the successive positions of the Command Post (TFH collection). The 193rd Glider Infantry Regiment was on the right flank of the division. The 513th Parachute Infantry Regiment was in the center and the 194th Glider Infantry Regiment was on the left flank. The 507th Parachute Infantry Regiment was in divisional reserve. The division was between the 101st Airborne Division on the right side and the 87th Infantry division on the left side. 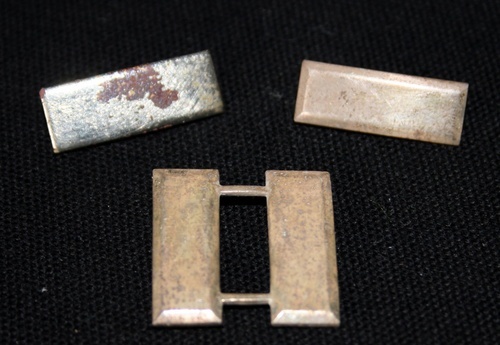 Divisional shoulder sleeve insignia from the three divisions who fought together during the first days of January 1945. 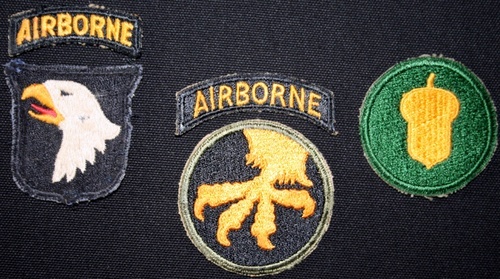 From right to left : 87th Infantry Division, 17th Airborne Division and 101st Airborne Division (TFH collection). This exceptional aerial photo realized by a USAAF observer on December 26, 1944 shows the position of the Second Battalion occupied on January 05, 1945. This position consists in the two woods located on the top left part of the photo. The road at the bottom of the photo is the National 4 road (« the Monti highway road ») (private collection, with courtesy). On the other side we founded from left to right: the Remmer Brigade’s 3rd battalion, the 29th Panzer Grenadier Regiment, the 8th Panzer Grenadier Regiment and the 104th Panzer Grenadier Regiment. In reserve, there were the 10th SS Panzer Division and the 11th Panzer Division. Saturday January 06, 1945. The Regiment received one platoon of the 707th Armored Battalion in support. The mission assigned at this platoon was the protection of the First Battalion. Under 101st Airborne Division request, the men of the 139th Engineer Battalion cleaned the National 4 road from its mines. At 20h45 during a meeting with the different units officers and attached units officers the regiment commander explained a January 07 attack plan. This plan forecasted the first battalion must take the village of Flamisoul however the Second Battalion must besiege the woods in the east of the same village. The H hour was 08h15 just after a fifteen minutes artillery preparation. One man died during the day. It is Private Robert A Sanchez (37344296) who passed away after wound. It is possibly a man who are in the jeep the previous day. 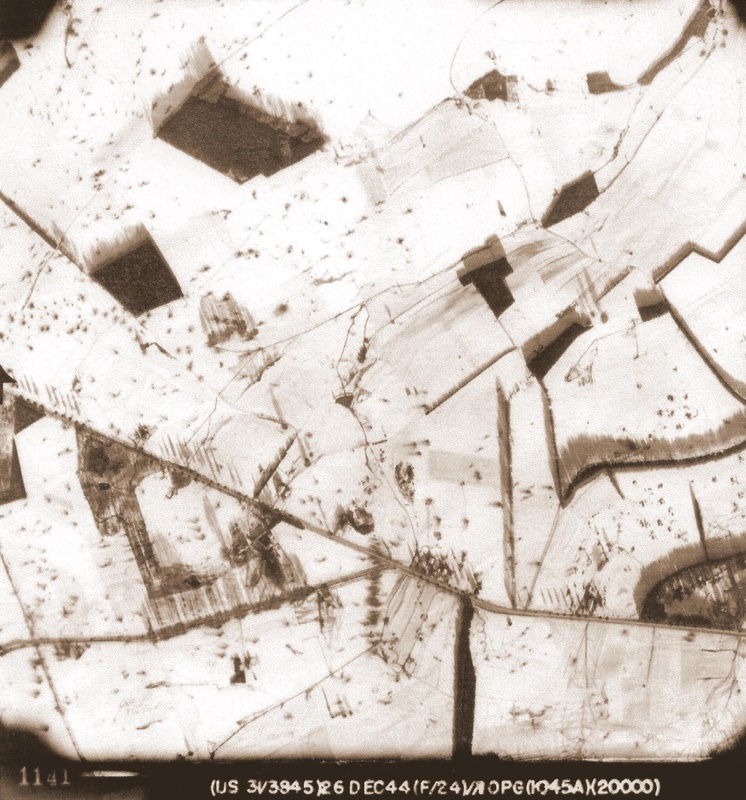 This other aerial photo shows very well the objective of the Second Battalion at the bottom of the photo. Bastogne is toward the southeast. The crossroad between Mande-Saint-Etienne, Flamisoul and Champs is not visible. We just see the road toward Champs (on the right) and Flamisoul (on the left) (private collection, with courtesy). I have found no information about this « Second French Battalion ». it is certainly the 392nd Engineer General Service Regiment (Colored) landed in France during July 1944 (Normandy, Northern France, Rhineland, Ardennes-Alsace, Central Europe). I suppose it is from the 392nd Engineer. May be it was a “Mackinaw” jacket. It is Joseph A Pello.